HP Drivers Update Utility updates your system drivers for HP devices automatically to let your HP device work properly. The HP Driver Update Utility keeps your system up-to-date. It detects which driver updates are relevant to your computer, and then helps you install them quickly and easily. It supports HP printers, laptops, computers, digital cameras, servers etc. HP Drivers Update Utility is free for scanning and no time limit. ...... the ground up using the latest technology with over 10 years' experience in the driver scanning/detection industry. * Machine Intelligence. Drivers Update Utility Machine Intelligence identifies your specific computer to provide you with the most accurate drivers available. Manufacturers supported by Drivers Update Utility include: Dell, HP, Compaq, Gateway, and more. 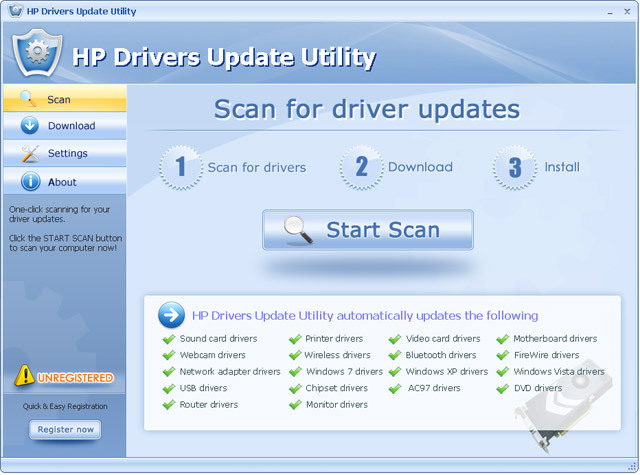 How to update drivers with HP Driver Update Utility? * Click the "Start Scan" button to scan your system drivers and find the out-dated drivers automatically. Qweas is providing links to HP Drivers Update Utility 3.0 as a courtesy, and makes no representations regarding HP Drivers Update Utility or any other applications or any information related thereto. Any questions, complaints or claims regarding this application HP Drivers Update Utility 3.0 must be directed to the appropriate software vendor. You may click the publisher link of HP Drivers Update Utility on the top of this page to get more details about the vendor.